Solenoid Direction Control Valves : 4WE6, 4WE10 Single/Double solenoid. The direction control valves consist of housing, one or two solenoids, the control spool & one or two return springs. In the de energized condition the control spool is held in neutral or initial position by means of return springs. The control spool is operated by wet pin solenoids. The force of solenoid acts via the plunger on the control spool and pushes this from its neutral position to the required end position. This gives free flow from P to A or B & A to T. When solenoid is de-energized the control spool is returned to its neutral position by means of return springs. To guarantee satisfactory operation care should be taken that the solenoid pressure chamber is filled with oil. 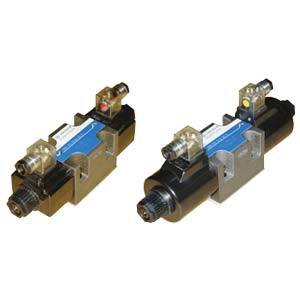 Solenoid operated direction valves control the start â�� stop & direction of flow. They are also used as pilot valves to operate other valves and so on.